Tomorrow is Art Ross’s birthday. It would probably be his 131st … but most records indicate it’s “only” his 130th. In the early days of researching my biography, I probably spent way too much time going back and forth with Art Ross III about the actual year of his grandfather’s birth. Then again, I figured that getting the birth date right was an important part of writing about him! Only some of what I found about Ross’ birthday made it into the book, but there’s plenty more if you’re interested. 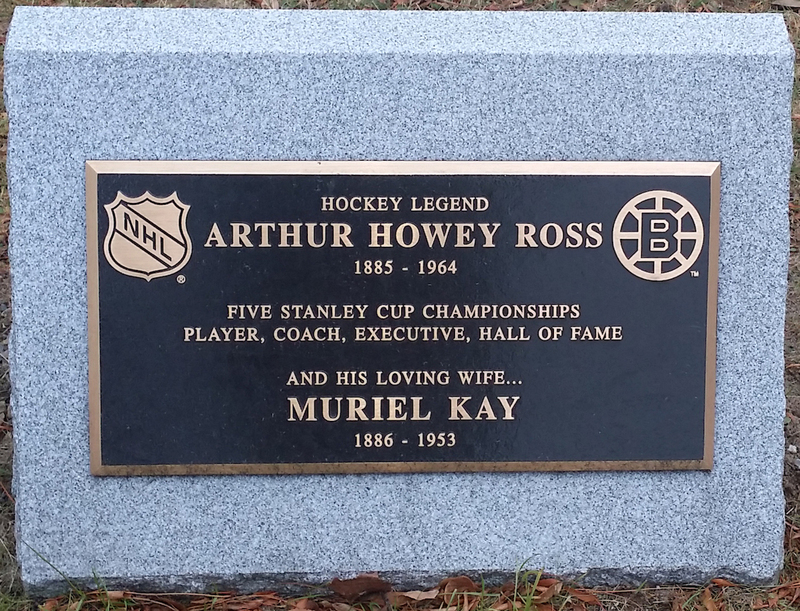 Unless I’ve already gotten to them, the vast majority of hockey sources that list birth dates say Art Ross was born on January 13, 1886. Unfortunately, there’s no actual birth certificate to confirm this. The only official Canadian document to offer proof is a page in the 1911 Census that lists Ross’s birth month as January and the year as 1886. No actual day is listed. However, his 1934 Immigration Registration card from the United States, his 1939 Declaration of Intention to become an American citizen, and his 1942 U.S. World War II draft registration card all list his birthday as January 13, 1886. In interviews, articles, and letters he wrote over the years, it certainly seems that Art Ross himself believed (or, at least wished others to believe!) he was born in 1886. Still, there’s plenty of evidence to suggest he was actually born in 1885. Art Ross III has his grandfather’s U.S. identification card from World War II. Old census forms are notoriously unreliable when it comes to determining ages and birth dates. Art Ross’s records are no exception. In the 1891 Canadian Census, he is listed as being seven years old, which would indicate a birth year of 1884. In the 1901 Census – which is the only early Canadian Census with columns for the month, day and year of birth – all the Ross children have a blank space where the year should be. The entry for “Arthur” lists only 13 Jan, but his age of 16 would indicate a birth year of 1885. Similarly, in the 1906 Census of Canada’s western provinces, taken when Ross was living in Brandon, Manitoba, Arthur’s 21 years of age would again suggest he was born in 1885.
although the middle name Houri (it should be Howey) is a little odd. More promising than the Census records are the records on file with the Bank of Montreal, whose archives include information on employees with the Merchants Bank of Canada that merged with BMO in 1922. 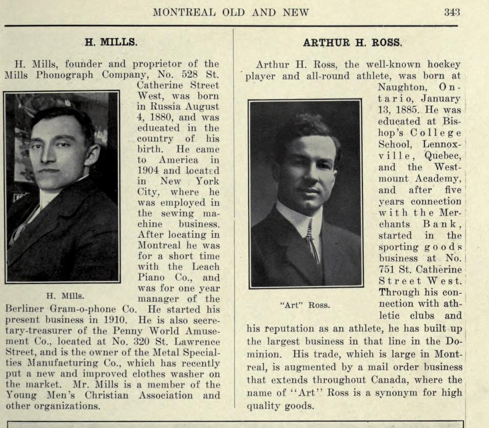 Those records indicate that Arthur Ross began work as a clerk with the Merchants Bank in Montreal on October 4, 1903. His date of birth is listed as January 13, 1885. Of course, it’s possible that Ross was lying if he had to be 18 to get the job. However, a birth date of January 13, 1885 is listed in a biographical entry for Arthur H. Ross in a 1915 guidebook to Montreal and its history. Also, Ross spent one year at the prestigious Bishop’s College School in 1898–99, and according to the school’s archivist, in correspondence with amateur Ross family genealogist Serge Harvey, Bishop’s records also show that Ross was born on January 13, 1885. Confusion again with the middle name. Herbert, this time, instead of Howey. When I first met Art Ross he was 12 years old and I was 11. Between then and now, Art seems to have lost time. He now claims he is a year and 23 days younger than I. My belief is that he is that year, less 23 days, older. But Art has lost his birth certificate (accidentally?) somewhere en route, so he has the edge on me there. Of course, even Frank Patrick seems a bit confused, because if Ross was claiming to be a full year and 23 days younger than Patrick, that would mean that he was born on January 13, 1887. Clearly, though, Patrick recalled that Ross had been older than he was when they were boys, and he believed him to have been born earlier in the same year that he was, and that year was 1885. This Montreal City Guide from 1915 shows a birth date of January 13, 1885. Then again, it credits Ross with two extra years of working for the Merchants Bank. When the grandchildren of Art Ross commissioned a new headstone in 2014 to replace the somewhat shabby original one marking his final resting place in the Mount Royal Cemetery in Montreal, Art Ross III, who has done years of genealogical research on his family, had the birth year 1885 etched into the bronze. It’s not quite carved in stone (and most sources will never catch up) but there you go. WOW, this falls into the ‘truth-is-stranger-than-fiction’ and at worst just as exciting a story as a ‘Murder-She-Wrote’ or ‘Poirot’ murder mystery! WAY more interesting and entertaining than mundane, topical redundancies on today’s or recent era players! Even I did not know ALL the ins and outs of this story–you really are a fantastically dedicated and meticulous researcher! Very interesting. I must say though, that the picture taken at your nephew’s Bar Mitzvah was terrific! Thanks for sharing. He looked a lot like my Nanna’s first hubby!! Very handsome! I love the research you did for this article….it is always a pleasure to read your blogs Eric!